When it comes to gutter cleaning and maintenance, no one does it better than our reliable and highly-skilled technicians, who operate throughout the entire Clapham and the surrounding areas. What makes our services so special? We are dependable, fully-insured for public liability, and competitively priced. Each customer who makes a booking with us is eligible for a free quote and a one-month quality guarantee. We are always ready and willing to come to your aid as we work seven days a week, including on public holidays. Don’t delay cleaning your gutters – contact our polite assistants and they will help you book an appointment at a convenient time! Many home owners put off cleaning their guttering system as this is a rather time-consuming, labour-intensive and even dangerous task. Unfortunately, the results of such negligence are anything but fun. 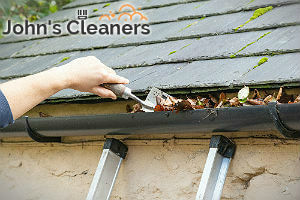 Blocked gutters often sag, overflow and soon after, start leaking. This leads to damages to your soffits and fascia boards, foundation cracks, wall discolouration, and even vermin infestation as compressed debris attract various insects. One way to spare yourself from incurring expenses in the future is to call us for a free gutter estimate. Our experts will readily visit you to inspect the condition of your gutters, clean all compressed debris, and unclog blockages if there are any. 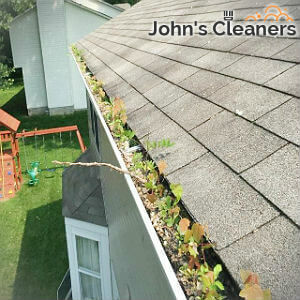 With our help, your gutters will not only look brand-new again, but will function properly. The company has invested in the latest gutter cleaning machines and telescopic poles made from light-weight carbon fibres. Thus, the members of our team are not required to use any bulky ladders which can scratch your paintwork and even deform your gutters. The poles can extend to reach hard-to-access gutters and have an on-board camera, which allows for a greater precision in the cleaning process. Our gutter cleaning service is available to businesses and residential property owners throughout the whole of Clapham, SW4. If interested in booking us, you can reach us over the phone or fill your requirements in our online form!